Publishing is when you save a copy of your place to the Roblox server online, where it’s stored so others can enjoy your place more easily. File > Publish to Roblox. Type a descriptive name and a description for your game. A thumbnail is a small image that represents your game. It’s important to spend time thinking of a thumbnail that’s exciting since it’s one of the main ways you’ll attract people to playing your game. On the right side of your place, click the Settings cog. On the left-side, click Thumbnails. Select Auto generated Image (Free). In the pop-up window, click Submit. Check that you have a Teams folder in the Explorer. The thumbnail is automatically created based off of the editor camera location last time you published your game. If you want to change it, move your camera in the editor, re-publish the game, and then re-generate the image. When you publish games, it’s automatically set to private. Nobody can play it on the platform yet, including you. We need to make our games public so others can play them. Make sure you are logged into Roblox online. Go to the Develop Page. Under the game name, toggle Private to Public. Decide if you want your game featured on your profile. Choose between OK or No. Congratulations! You have published a game, and are officially a Roblox game developer. Players all over the world can play your game! 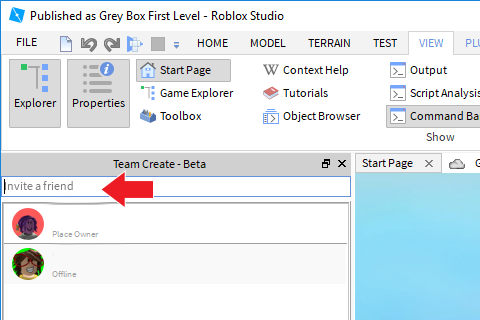 Team Create allows you to work together with multiple people to create a game. Once you are in team create, you can invite friends. Turn Team Create off when you are done if you don’t want people to keep working on it. Always publish your game right before turning on Team Create to work on your most recent file. Click on the the View Tab. Type the name of your friend in “Invite a friend”. 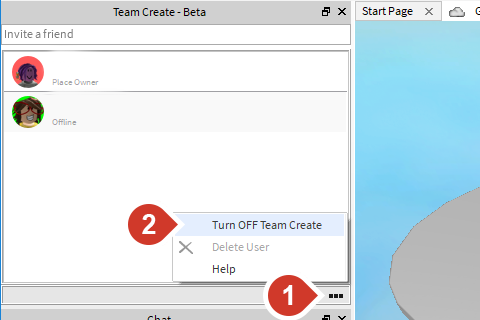 You can always turn off Team Create whenever you’re done testing. Click … in the bottom-right corner of the team list. Select Turn OFF Team Create. If you have any questions on what the final project should look like or need a reference, you can download an example. Your game might be really obvious and easy to you, but others may help point out things you may not have noticed, such as an especially difficult jump or the theme isn’t clear at times. Others can also give you unique ideas that will make your game better. Always get other people to play your games and give you their honest opinion. This will make you a stronger game developer. Before playtesting, always make sure to re-publish your game. If you forget, others won’t be able to see your most recent work. An alternative activity is to have students round-robin take turns in front of each other’s games to test. Tester’s favorite thing and why. One way the designer can make the game more engaging and fun. What parts of the game were too hard or too easy? What was something you didn’t expect? Did that make the game fun or frustrating? Allow 10 minutes for students to playtest their games. Based on the unique needs of your class, you can always take more time. Don’t yuck my yum: for example, if someone really worked hard, don’t dismiss their work. Before starting, ask students to describe the difference between saying mean things about a game and giving advice. Additionally, ask what they should do while testing someone's game (be thoughtful and attentive) and what they shouldn't do (play and not reflect on their game). Use Team Create to have students split into two teams. Each team starts with Player Spawns in different areas and has to build bridges to get to the center. Each player must have to make at least two little jumps and one big jumps while being in danger of dying if they don’t make it. Good activity for review after a break or at the start of the next section. Forces students to start working with design constraints in a fun way. Can be elaborated on to require additional elements that were previously taught such as including transparent bricks, or bricks of different colors and materials.